MADERA, CALIFORNIA (September 25, 2018) – Madera Speedway’s busy stretch of major Late Model races continues Saturday night with the second appearance of 2018 for the SPEARS SRL Southwest Tour Series. USAC Western US Midgets, CSS 360 Super Modifieds, Legends of Kearney Bowl, Legends of the Pacific, and Madera Hobby Stocks will also compete during Saturday’s races. All told, more than 300 laps of competition will take place on the one-third mile asphalt oval. Jeremy Doss, the 2013 & 2014 SRL championship runner-up, is aiming for his first series crown and leads the championship into Madera. Doss used a last lap pass to win the season opener at Madera, and added another victory in May at Las Vegas. 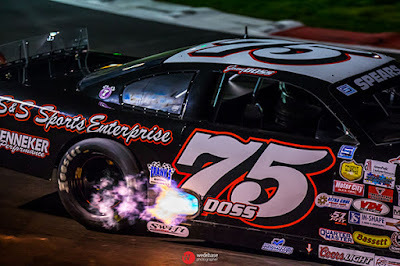 Doss has podiums in five out of six starts this year and his Madera resume includes two Pacific Challenge Series wins as well. Eric Schmidt ranks second in the standings and last won at Madera in 2006. He went on to win the championship that season, meaning a win on Saturday could be a harbinger of things to come. Ricky Schlick, Livingston’s Carlos Vieira, and St. Mary’s High School graduate Jeff Bischofberger round out the top-five in the points. All three are still in search of a win in 2018. Cole Moore leads the Rookie of the Year standings from sixth in the points. Many drivers with local ties are expected to compete including Stockton Tri-Holiday champion Matt Wendt of Lodi, Ripon’s Michael Sandoval, Manteca’s Eric Nascimento, Jr., and 2008 Altamont Raceway Park champion Jason Gilbert. Adam Lemke, the current Rookie of the Year points leader in the RPM Mortgage Pro Late Model Series at Madera, will make his debut in the series. All told, more than 20 cars are expected to compete in the 125 lap feature presented by 51FIFTY Energy Drink. Lemke will also be busy with the USAC Western US Midgets, where he leads the points after a dominating season during their eight visits to the speedway. The resurgent 360 Super Modifieds are fresh off of the Donnie Large Memorial during the Harvest Classic, where Eric Humphries of Chowchilla darted to victory. Steve Schermerhorn has already clinched the Madera Hobby Stock championship with still two rounds to go in the competitive division. The traveling Legends of the Pacific routinely average 15-20 entrants per visit at Madera with Saturday marking their sixth and final run of the season. Action gets started on Friday evening with pit gates opening at 2:30 p.m. and practices from 4:30 p.m. – 8:30 p.m. Saturday’s pit gates swing open at 11:30 a.m., followed by practices at 1:30 p.m. Time trials and heat races for the local divisions will follow, along with the 360 Super Modified main event and SRL Southwest Tour qualifying, before opening ceremonies officially take place at 7 p.m. The SRL Southwest Tour 125 presented by 51FIFTY Energy Drink is slated to go green at approx. 9 p.m.
Tickets for this great night of racing are just $20 for adults, $17 for seniors, $10 for youth ages 6-12, and kids five and under are free! Madera Racing on MAVTV airs Thursdays re-runs of the 2017 season every week. The show airs at 5 p.m. and 8 p.m. PST and is also available on the Lucas Oil Racing TV app. Round #5 of the RPM Mortgage Pro Late Model Series from May airs on Thursday September 27th.